. . . a jumping spider has taken up residence on Roots 2. As you can see, Jumpy is a colorful little fellow, and quite friendly, too. He (she?) will let me get a finger to within an inch, or so, then he raises his front legs to let me know I am getting too close. He also “follows” my finger as I make circles around him, to make sure I don’t sneak up behind him. Roots 2 is now “done” and in place near the east property line. 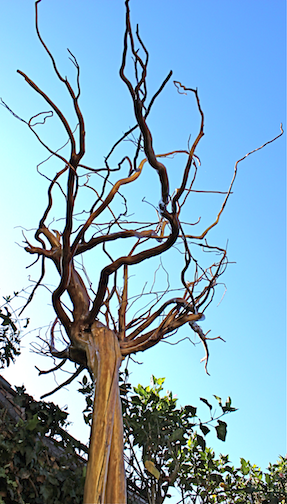 Here is a photo of Roots 2 standing tall and reaching for the sky . . .
More about Roots 2, soon. 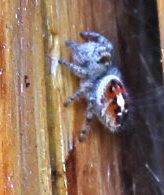 This entry was posted in Pets and tagged jumping spider, Roots 2, spider. Bookmark the permalink.